Paul Mullen (right) working at his union job. Considering that union boss John Kane handily fell to Tom McGarrigle last November while running as a Democrat, and considering that union boss Paul Mullen lost yesterday in what should have been a Republican gimmee while running as a Republican, and considering that John Kane endorsed Paul Mullen this race, maybe the leaderships of both parties should figure a union connection is the kiss of death in Delaware County, Pa.
Mullen, FWIW, was not just endorsed by the trades but by the PSEA which is the public teachers union. The winner of the race Leanne Krueger-Braneky did get the endorsements of United Food and Commercial Workers Local 1776 which represents the state store workers, and the SEIU so don’t expect her to back the necessary reforms anymore than Mullen would have. She will take the side of the Gary Schultzes of the world rather than the widow on Social Security or the married couple with two kids who just bought a home. She will fight against privatizing the State Store system. So she is neither a friend of common sense or compassion and will have to be fought herself. But those of the 161st District can only blame the county and state Republicans that she is their representative. The past month has been tumultuous, the past two days a blur. One lesson I learned a long time ago was significantly reinforced today: no matter how much money, power and influence you may possess, unless you are true to who you are, none of that matters. At all. I would like to congratulate Leanne Krueger-Braneky on her election to represent the good people of the 161st District. Most importantly her team ran a solid campaign, she was true to her beliefs and ultimately triumphed because she remained true to herself. Politically, philosophically, I would say she and I are polar opposites but at the end of the day we are who we are. Lisa Esler did something for me that no other person running for office has done in the 25 years I have voted. She gave me the opportunity to cast a ballot for a true conservative. Unwavering in her beliefs, unflinching in her resolve Lisa spoke Truth to power and has given a wayward Republican party a very necessary wake up call. The base didn’t leave the party, the party turned it’s back on the base. Some pundits will categorize Lisa as the “spoiler”. I fully reject that notion. People would have simply stayed home. I say this with confidence because history shows this to be true. The presidential election of 2012 is but one example that supports this. Personally, if Lisa didn’t throw her hat into the ring Leanne would have had my vote. I would rather vote for someone who I disagree with but is frank about their positions and honest about who they are. Leanne still would have won but with a higher margin, the voters just want someone who says what they mean and mean what they say. Throughout this election I met some incredible people too numerous to list. Lisa’s volunteers were passionate, well informed, articulate and sincere. I feel I met some people that I will potentially be friends with for a lifetime. I learned a lot, I especially learned a lot about myself and what I truly believe. I want to thank everyone who helped Lisa by volunteering their time, treasure and talents and especially the folks who voted for her. Mr. Dychala was active in Mrs. Esler’s campaign. 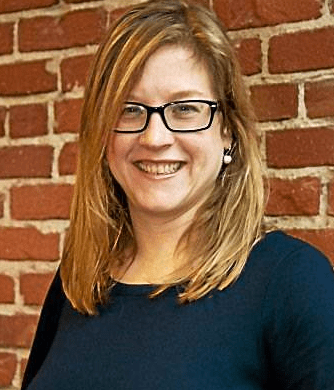 Democrat Leanne Krueger-Braneky has won today’s (Aug. 4) election for the vacant 161st District Seat in the Pennsylvania House. According to unofficial numbers from Delaware County, Mrs. Krueger-Braneky has received 4,791 votes, while Paul Mullen, who for some unfathomable reason had been tapped by the GOP, got 4,268 votes. Mullen is the county’s AFL-CIO president and had been supporting Democrats until this election. There were 988 write-in votes cast most of them likely going to Republican write-in candidate Lisa Esler. Mrs. Krueger-Braneky beat Mullen by more than 1,000 votes in Swarthmore. The seat was vacated April 30 by Joe Hackett who easily beat Mrs. Krueger-Braneky last fall 12,612 to 9,916. Hackett said he wanted to return to law enforcement. Why the county Republicans would pick a candidate like Mullen who they should have known would absolutely outrage a substantial portion of the base is certainly a mystery. Why they would pick a man unwilling to face questions from the public is beyond comprehension. More significantly, with a pension bomb looming and property taxes rising, they should have understood that it was necessary to take the appropriate stands on issues such as banning teacher strikes and ending prevailing wage rather than picking a candidate that would oppose reforms. Hopefully, they learned a lesson. We are not sure. Now, for some secrets from the campaign. Lisa Esler did not want to run. When she heard Mullen was seeking the candidacy she made her own submission with the expectation that the GOP would pick a compromise candidate. If the party leadership, picked the toil-in-the-vineyard hack she expected them too — rather than a supporter of extreme liberal candidates and an opponent of the fiscal reforms that she saw as a school director as being desperately needed — she would have shrugged her shoulders and maybe even worked to get him elected. Further, she is certain the endorsement meeting May 28 was fixed despite the protestations of County GOP Chairman Andy Reilly. A Facebook posting was made an hour before the meeting declaring Mullen to be the nominee. No amount of spinning can change that. Neither, can any amount of spinning change the reality that Mullen avoided explaining where he stood on anything. Anyway, kudos Lisa Esler. You can only be proud of yourself. Delaware County GOP boss Andy Reilly sounded a bit flustered on Dom Giordano, today, Aug. 3. 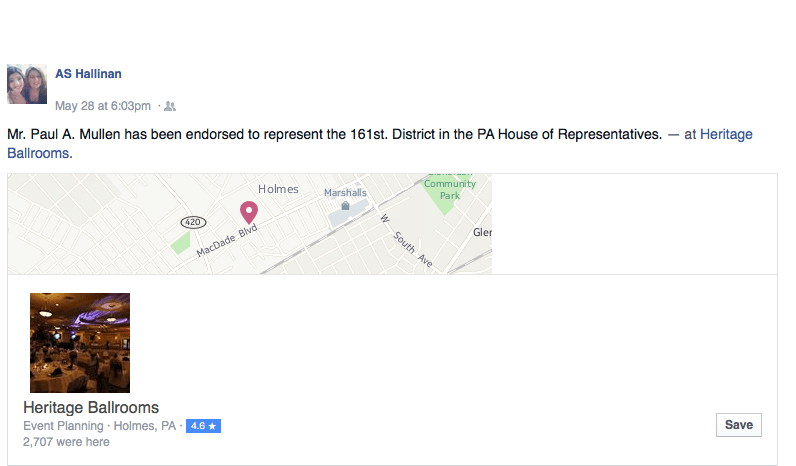 The posting by AS Hallinan was made May 28 at 6:03 p.m. and reads Mr. Paul A. Mullen has been endorsed to represent the 161st District in the PA House of Representatives. — at Heritage Ballrooms. The meeting didn’t start until 7 p.m. He said a report that an email saying Mullen’s candidacy was announced an hour before the nomination meeting is ludicrous. Of course it is. It was a Facebook posting. Again of course. Mullen is a liberal because he supports liberal candidates. And Andy, it’s not just about “some picture“. This is what Mullen said in 2010 about Sestak: A lot of politicians say they’ll support you when they run, then they turn their backs on you. Joe’s the opposite. He stands tall with the IBEW. Members here—they know Joe. He’s been to the hall several times and he’s toured our training facility. He’s definitely one of us. Andy speculated what Mullen’s possible positions might be.It would have been kind of nice if Mullen could answer the questions himself. Write-in Lisa Esler tomorrow. She’s the one with guts. Lisa Esler appeared on the Chris Stigall 6:15 a.m., this morning, Aug. 3. She will be on Dom Giordano at 10 a.m. Dom has just said Paul Mullen should not be in office and if the official Democrat should win it wouldn’t make a difference. It can be heard on 1210 AM radio or here. From left, Leanne Krueger-Braneky, moderator Philip Hodgson, Lisa Esler and an empty seat for Paul Mullen. Two women gave honest presentations before a standing room crowd of at least 60 this afternoon, Aug. 2, as to where they stood on the issues facing Pennsylvania, while the endorsed Republican hid like, well, a little girl. The forum sponsored by Delco Debates was held in the Swarthmore council meeting hall and concerned Tuesday’s special election for the vacant 161st District State House seat. The participants were Democrat Leanne Krueger-Braneky and write-in Republican Lisa Esler. 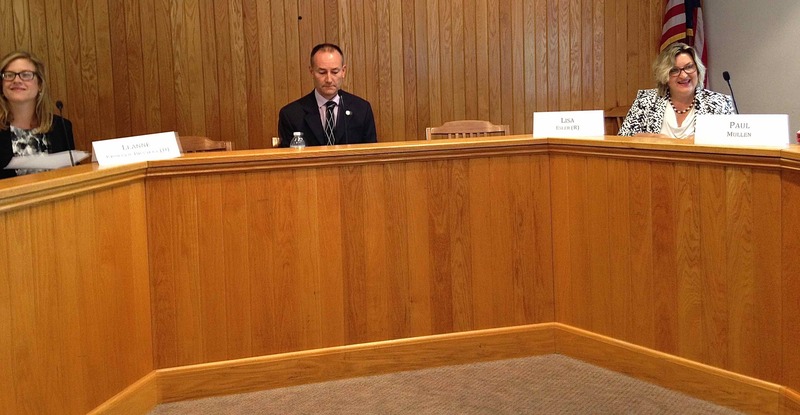 A empty chair was placed for Paul Mullen, the county AFL-CIO president who was tapped by the GOP. Several invitations were sent to Mullen who never responded. Mrs. Krueger-Braneky of Swarthmore, described herself as business consultant, a mother of a three year old and a person of faith. She said she supported legalization of medical marijuana, a taxpayer bailout of the state’s pension funds, and a severance tax on natural gas drillers. She also said she supported Gov. Wolf’s proposed tax plans and more money for education. She said Pennsylvania had the most unequal funding for schools in the nation. “I want good schools,” she said. “I want good schools for kids in Philadelphia. I want good schools for kids in Chester. She said she opposed the sale of Pennsylvania’s publicly owned liquor stores, as they make money for the state. She said that during holidays, people from Delaware and New Jersey sometimes shop for liquor in Pennsylvania due to that state-regulated pricing. That claim drew murmurs of skepticism from the crowd. She said she opposed school vouchers and a 401K-type plan for state workers. She said she supported adding pre-school education. Mrs. Esler, of Aston, who has described herself as a wife, mother, grandmother, certified optician, and Penn Delco school board director, and who makes her driver listen to K-LOVE, said she opposed a severance tax on natural gas drillers as long as the state’s corporate tax was 9.9 percent as she feared driving them out. She noted she would reconsider if the state were to cut the corporate tax to the rates of states that charge a high severance tax. She said she supported privatizing the state stores. She said she supported school vouchers. She noted that the pension crisis was drastically driving up property taxes and supported moving state workers and legislators to a 401-K type plan as most private businesses have. She pledged not to take a pension if elected. She said she had not thought much about medical marijuana before entering the race in June and has heard pros and cons during her campaigning. She promised to keep an open mind. In a question regarding more funding for public transportation, Mrs. Krueger-Braneky praised the gasoline tax increase passed by the legislature in 2013 and said she supported more funding for SEPTA while Mrs. Esler did the opposite. Mrs. Krueger-Braneky said public transportation was good for the environment while Mrs. Esler noted that people who have to use their cars are already hurting. Neither candidate was familiar with a plan to have sewer treatment plants handle fracking and mine waste but both thought the idea was pretty disgusting. In a question concerning the state’s policy of life without parole for certain crimes, Mrs. Esler thought those who committed heinous murders deserved it while Mrs. Krueger-Braneky was open to the idea of reform. With regard to easing the state’s recently found-to-be unconstitutional rules for minor party ballot access, Mrs. Krueger-Braneky appeared to feel they shouldn’t be eased much while Mrs. Esler thought they should be. “The two-party system is broken,” she said. Both candidates express dislike for the property tax. Mrs. Krueger-Braneky supported the reforms proposed by Gov. Wolf. Mrs. Esler said she supported eliminating it but expressed concerns about existing legislation as it would punish school districts that had been fiscally responsible while rewarding those otherwise. Mrs. Esler said spending reforms were the best solution. She noted that simply ending the prevailing wage mandate would have saved the Penn Delco School District $8 million in recent construction costs. Mrs. Krueger-Braneky supported more education spending. Mrs. Esler noted that in the last 14 years, the state’s student population has dropped by 35,000 while school employees have increased by the same number. Mrs. Esler said waste was rampant in Harrisburg. She said there was $2.2 billion in unemployment fraud during the last four years and between $2 billion and $4 billion in welfare fraud. In a response to a question regarding the repeal of the “temporary” Johnstown Food tax of 1936 that to this day adds 18 percent to the sale of booze in Pennsylvania, Mrs. Esler pointed out that the taxes being sought by Gov. Wolf would be “temporary” in the same way while the property tax relief would soon end. Regarding Mullen who was hiding, it was twice noted during the course of the forum that he actually ran away from questioners during his door to door campaigning. 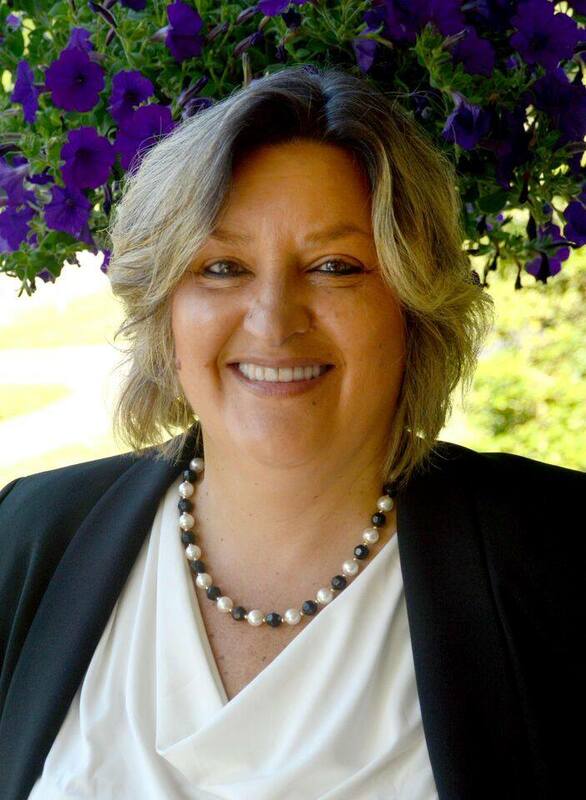 Lisa Esler, the Republican write-in candidate, for the vacant 161st District Pennsylvania House Seat, will be appearing on the The Behind The Mike Show internet radio program, 8 p.m., tomorrow, Aug. 2. She and Leanne Krueger-Braneky, the official Democrat, will be appearing at a forum 2 to 4 tomorrow afternoon at Swarthmore Borough Hall, 121 Park Ave sponsored by Delco Debates. 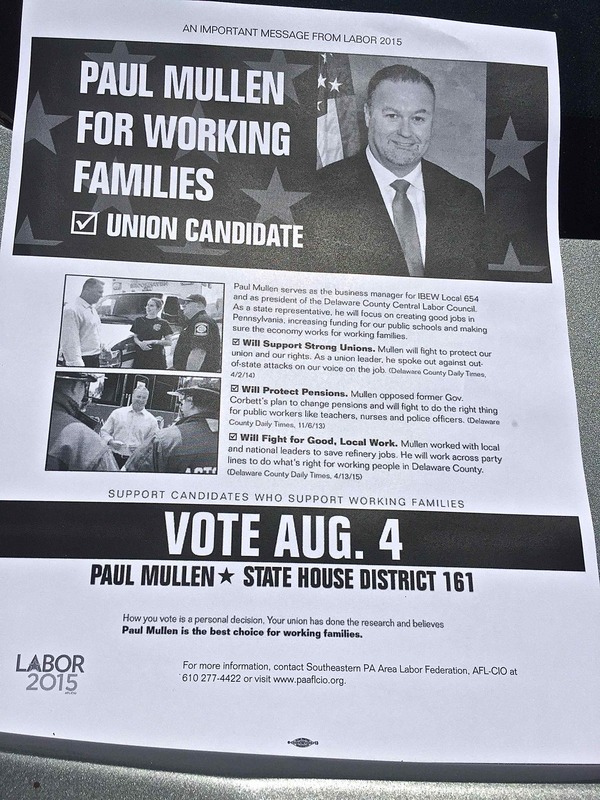 The official government-party candidate, Paul Mullen, a union official endorsed by the GOP this time but until a fews ago had been supporting hard-left Democrats, has pointedly ducked all debates. Busy Sunday For Lisa Esler. Gov. Tom Wolf will lead a rally for Leanne Krueger-Braneky, 10:30 a.m. tomorrow, Aug. 1, at the Swarthmore train station at Chester Road and Park Avenue. Ms. Krueger-Braneky is the official Democrat in the special election for the vacant 161st District Pennsylvania State House seat. The Republican-endorsed Democrat is Paul Mullen who gets a $130,000 salary as business manager of Local 654 of the International Brotherhood of Electrical Workers and by all accounts intends to keep it even if he should win the election..
Until a just a few short weeks ago Mullen had been campaigning hard for Democrats as liberal as Ms. Krueger-Braneky. In fact, if I lived in the district, I’d seriously consider voting for her. OK, I’d write in Mickey Mouse but, really, I would rather have her in the legislature than Mullen. She’d be far less of an obstacle to advancing the cause of the necessary reforms to keep the taxpayers from being crushed by the corruption, especially the legal corruption, rampant in our capital city. Fortunately, in this round I would not have to vote for the naive leftist or write in Mickey. There is an honest person who cares about homeowner, the parent and the elderly person on a fixed income. Her name is Lisa Esler and she has launched a write-in campaign that has a fair shot at winning. The election is Aug. 4. State Republican bosses are spending big in an attempt to get this Democrat-supporting union boss elected to the State House. Campaign finance reports were filed with the Pennsylvania Department of State last Friday, July 24. Although they are not yet available online, we spent some time reviewing the filings and wanted to pass on some interesting information to our readers. GOP-endorsed candidate and union boss, Paul Mullen raised $52,700 directly from union-affiliated political action committees (PACs). He also received a $10,000 contribution from County Council Member David White’s PAC. 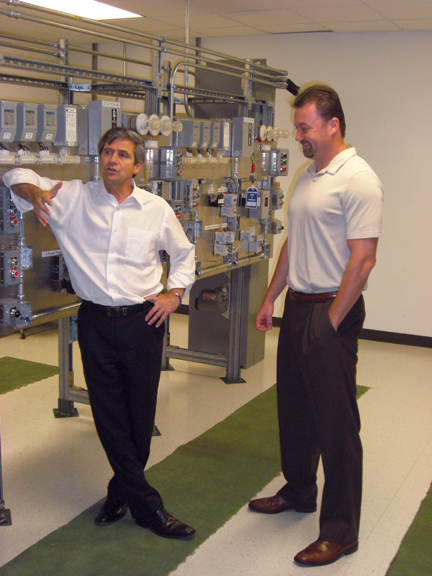 White owns a union mechanical contracting company. The direct union PAC contributions represent over 50 percent of Mullen’s fundraising total for the report. Mullen also benefited indirectly from the generosity of the House Republican Campaign Committee (HRCC). The HRCC contributed $150,000 to the Pennsylvania GOP’s PAC. The GOP’s PAC then spent $88,825 on campaign materials provided by Hallowell and Branstetter, who are Mullen’s campaign consultants. Based on conversations we have had with folks in the 161st district the state GOP has sent at least 10 direct mail pieces to voters. If you are a donor to the state GOP or the HRCC, you should be asking yourself if electing a union boss is how you want your money being spent. The argument that a Republican union boss is better than a Democrat certainly does not hold water. Having someone in the Republican caucus, who is likely going to continue collecting a paycheck from the union, will make closed-door strategy sessions meaningless. Mullen is opposed to moving state employees into a 401k style system; opposed to paycheck protection and opposed to enacting right-to-work laws. If the caucus is ever in a position to move those types of legislation, how likely is it that Mullen will not spill the beans to his buddies in the labor movement and keep his campaign promise to fight against these reforms? If there are any further developments related to the Aug. 4 special elections, we will pass them along. Otherwise, we will let you know the election results as soon as they become available. 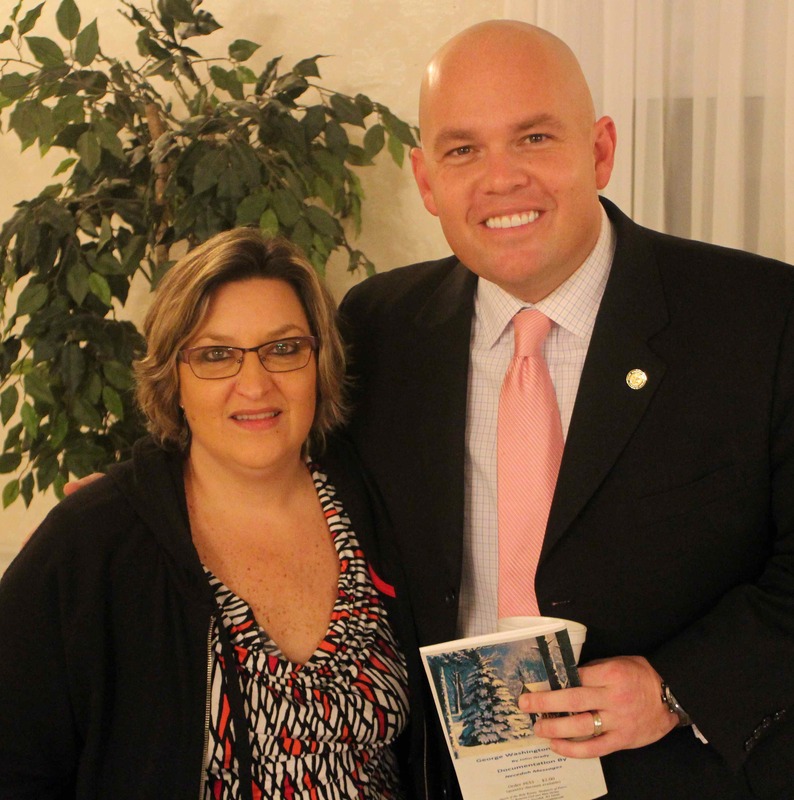 Lisa Esler wants to end the state-mandated school tax hikes. A letter from an Aston GOP committeewoman in yesterday’s (July 30) Delaware County Daily Times blasted Lisa Esler, the Republican running a write-in campaign for the vacant 161st District Pennsylvania House seat, for being part of a school board that raised taxes in each of the last three years. It ought to be noted that the votes by Penn Delco School Board for the tax hikes were overwhelming. There is a reason for this. School boards in Pennsylvania are mandated by law to fund numerous things, pay expensive contracted raises to people who can negotiate without the concern of being replaced or removed, and pass a balanced budget. It is not far off to say it is impossible for a school board not to raise taxes. In fact, you can even say the state legislature has passed the buck to make the boards — that are staffed by unpaid concerned citizens — do the dirty work in imposing unnecessary spending on property owners for the benefit of the lobbyists and special interest that are the true constituents of our political class. Lisa Esler knows this and is running to change this. If ever-increasing property taxes are your concern she’s the one who should get your vote. Her opponent, Paul Mullen, the county’s AFL-CIO President, is endorsed by the teacher union which has been the primary obstacle to educational progress in Pennsylvania. Quick quiz how often are bad teachers fired? The PSEA overwhelmingly gives to Democrats. That it is ignoring the D in this race should give one pause. Further, one of the few issues upon which Mullen has taken a stand concerns his declaration that he will oppose all significant reforms to the underfunded state pension programs that even if instituted will still cause property taxes to explode.